Just under half (44%) live in a community served by a single daily. 32% don’t have a daily, and 24% have more than one to choose from. 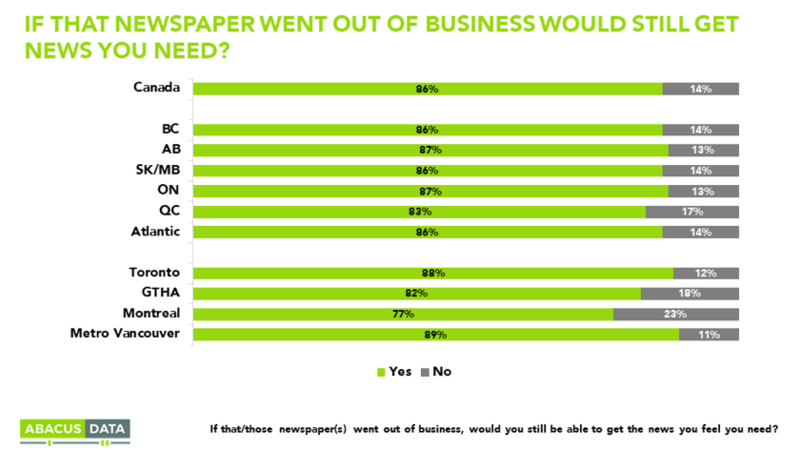 Fully 86% believe they would still be able to get the news they need if their daily newspaper went out of business. Only 14% felt they would not. Consumers’ confidence that they would manage to get the news they need – was widespread in every region, among all age groups, both genders, urban and rural dwellers, homeowners and renters, and supporters of all three major parties. 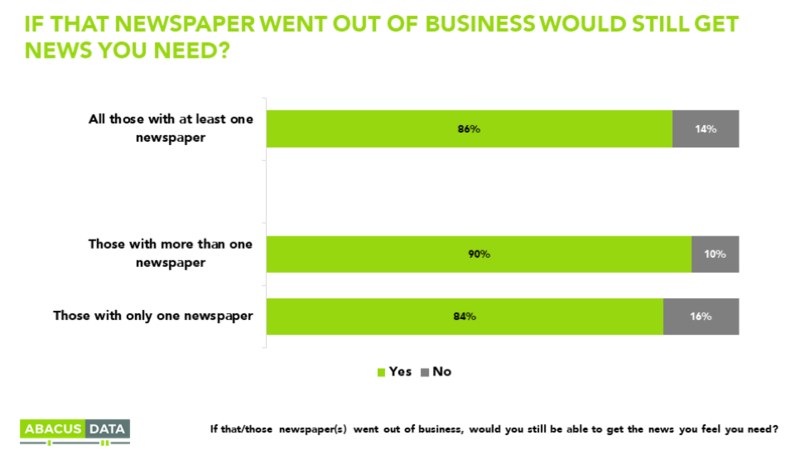 Even among those who only have one newspaper in their community, 84% think they would still be able to get the news they feel they need. 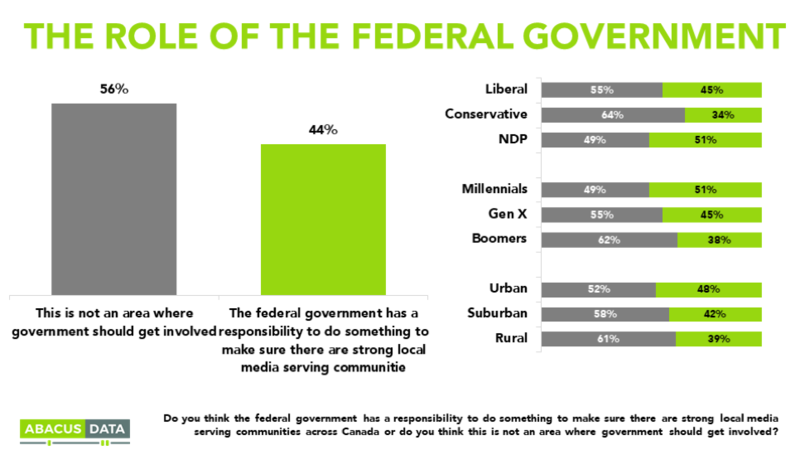 Reactions were mixed on whether “the federal government has a responsibility to do something to make sure there are strong local media serving communities across Canada”. A sizeable minority (44%) see a responsibility to do something, but most (56%) say “this is not an area where government should get involved”. Millennials (51%) were more likely to want some government action compared to Boomers (38%) but opinion is clearly split no matter what the age group. Opinion on government intervention is a bit different depending on political affiliation. NDP voters are evenly split (51%-49% in favour of action), Conservatives opposed (66%-34%) and Liberals in between, but leaning laissez faire (55%-45%). 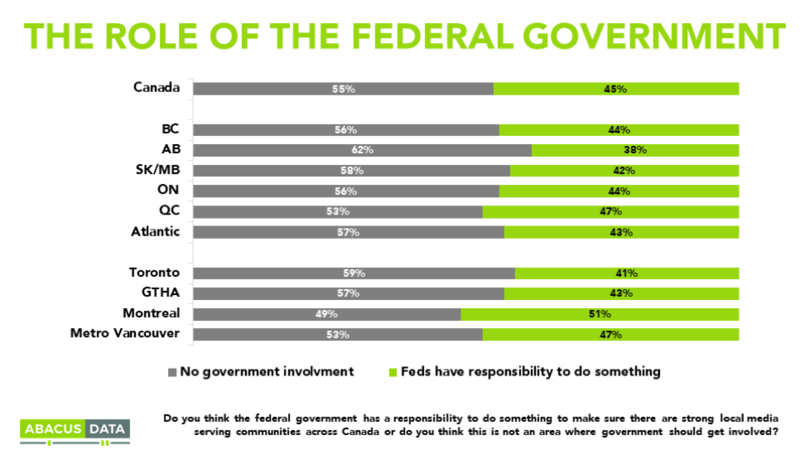 Albertans were more likely to oppose federal government intervention, and Quebecers more likely to support it, but views were fairly similar across the country, including in the largest cities. 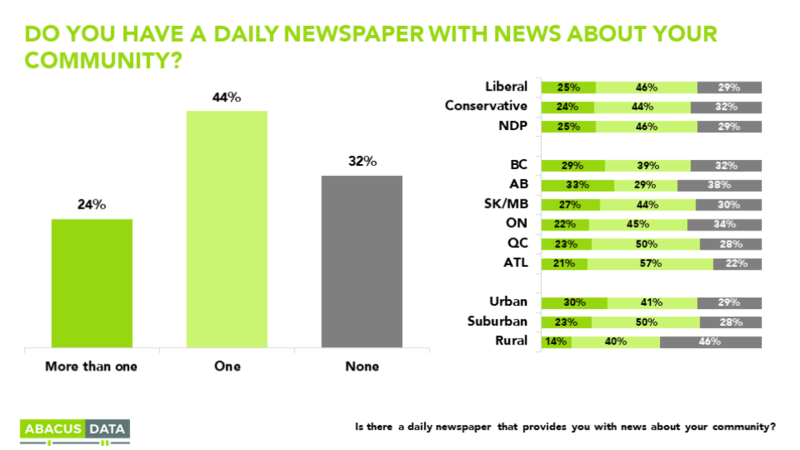 Those with only one newspaper were just as likely to oppose government intervention as those served by more than one newspaper. 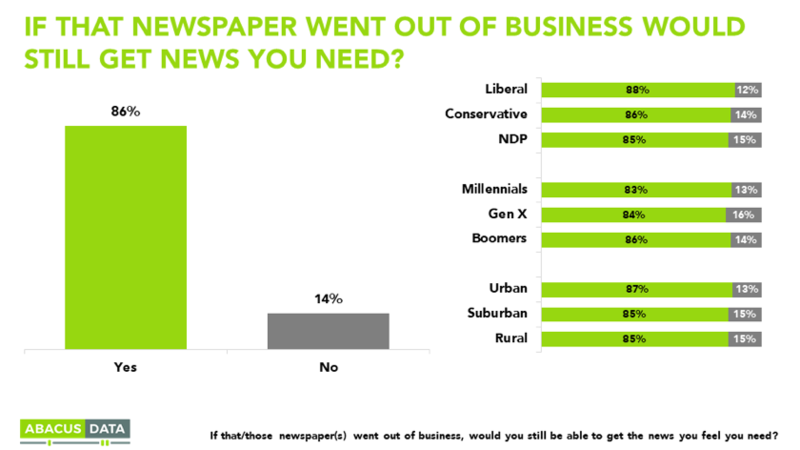 According to Bruce Anderson: “Newspaper bankruptcies, should they occur, may have a more severe impact on the amount and the quality of information than Canadians imagine will be the case. Because people consume information using a variety of digital platforms, they may not be as aware as used to be the case of the sources of their news, and the important role of local newspapers in newsgathering. It’s also possible that they believe that different media outlets will fill in the gaps that would occur with newspaper failures, using different business models. Our survey was conducted online with 1,518 Canadians aged 18 and over from June 2 to 5, 2017. A random sample of panelists was invited to complete the survey from a large representative panel of over 500,000 Canadians. The Marketing Research and Intelligence Association policy limits statements about margins of sampling error for most online surveys. The margin of error for a comparable probability-based random sample of 1,518 is +/- 2.6%, 19 times out of 20.